You may still be looking in your inbox for that new update on what’s going on with your beloved Goddess Crew. You may have missed it but we have moved!! Head over to AphroditeKinks.com and subscribe to get more natural hair, beauty, love and now self love posts!! Oh and of course many giveaways to come!! Check-In!! Same content, new location, greater experience…see you there!! 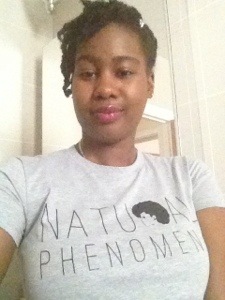 Today March 16, makes one year since I have been natural. My how time flies!! I really don’t know where the time went. I constantly look back at old flicks of my BC and still can’t believe that I actually did it. I also see how much my hair has grown and how fast. YES, black girls can grow long hair!! lol Even though it’s still only a couple inches. As well today marks the beginning of something great. I have been sharing a few of the details with you and now it’s finally here!! It’s officially the launch day of my site; AphroditeKinks.com. I am proud to say that we have branched out and I love it. Look around and enjoy the view Goddess Crew. You all have made this possible for me to share this, my baby with you all. She has grown into much more than I have ever dreamed of. Hope that I can continue to inspire you all and be inspired by you all. You know I couldn’t celebrate all this without throwing in some goodies right!! HaH Well guess what you can win some lovely goodies for being such amazing Goddess’. Thank you for your continued support, love and strength. We have taken the journey together and will continue to grow. To Enter: Log on to AphroditeKinks.com, for details!! Don’t forget to join the Goddess Crew by Subscribing to our new space!! 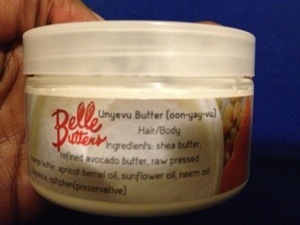 I had been hearing people rave about products by Belle Butters especially the Uneyvu Butter. I decided to take a look at the goodies Belle Butters had to offer and fell in love with almost everything. 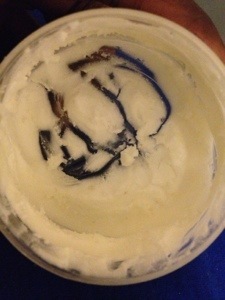 I came down to one product and it was the Unyevu Butter. The product contains all natural ingredients: shea butter, raw pressed mango butter, refined avocado butter, apricot kernel oil, neem oil, sunflower oil, fragrance, and vitamin E.
Which makes the smell a mixture of greatness. It’s hard to describe the scent, but the best thing I could come up with was a sweet nutty scent. The consistency was super rich and AMAZING!! It went on smooth and left my skin moisturized and feeling smooth like butta. Oh and this ish was long lasting too. By the end of everyday my skin was still very moisturized and smelled like that sweet buttery nut. The good thing about the item is that it can be used on the hair as well as the skin. In addition some of the Belle butters sales go to Charity Water and it’s packed with all natural ingredients, so it kinda makes it worthwhile. Now that my hair is getting longer, and the wash & go thing was not happening, I have been experimenting with different protective styles. I pretty much wanted to protect my hair from the wind and that good ole hand in hair syndrome. To style gel was applied, as the hair was french braided up, followed by a twist swoop to the right side. To finish up and to keep the hair in place I used an old rhinestone clip. By the way, I was feeling like a big time Rasta with them twists. I would totally do some twists again, I love the locs feel it gives me. When you walk down the street, you cant help but to turn heads. Like a force of nature, you cannot be denied. Black Cotton Apparel celebrates the natural phenomena that is you. It was so me! Recently, I have been filled with smiles even when things may not feel all rosey. I have learned to accept people and things as they are. You cannot change anyone but yourself. I know it sounds very cliche but, it is true you have to change yourself if you want change. Well, let me get back to the tee! I put it on and my day felt brighter and I was many more smiles. It was midweek and I was happy to be alive and well. I was feeling exactly what the tee read, hence why the song kept playing in my head; “something like a phenomena, something like a phenomena”. 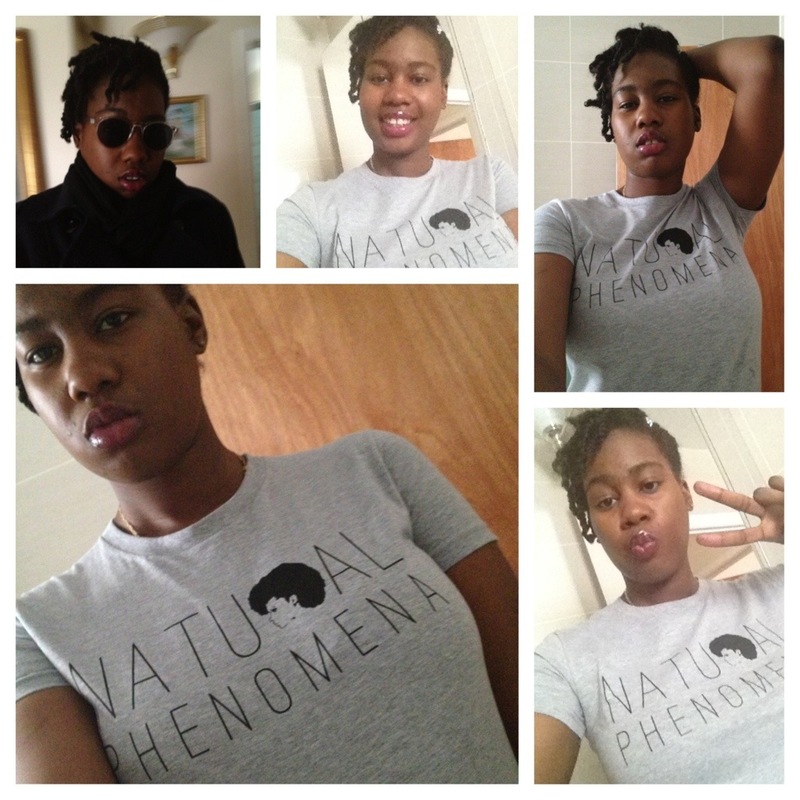 I say all of this to encourage you to be a phenomena, natural or not! Love who you are, where you will go and where you have come from. It is all a journey, whether we accept it or not one day you will have to. Appreciate all of your journey, good or bad, you where created for this. & Guess What….You get 15% for being apart of my lovely Crew!! Use coupon code : NAT213. Get to it, you don’t want to miss out on something so phenomenal!! Why I stopped my hair subscriptions!! I had just did my Big Chop and I was fresh out the chair. I had to go back 7 years to remember the tricks of the trade, many of which were most likely wrong for my hair anyways; I couldn’t go back to using the “Indian Hemp” hair grease, or using that blow drying every week. How in the hell was I supposed to re-learn my beautiful kinks. What the hell was I supposed to use? I can’t use the “Perfect for perm” or the products that have loads of crap that was destroying my hair. To my surprise, no there wasn’t an app for that, but there was a subscription for that. HEY BOO!! LOL. I was a couple months behind until I found out about the whole subscription movement, but I knew I had to get on. I just had to get on that V.I.P list. Me and my hurr were VERY IMPORTANT PEOPLE!! Sitting in front my computer I was able to make the first purchase to every product junkie’s dream. I now was en route to figuring out the new products I would have, to learn to use on my new hair. I was in HEAVEN! I mean who wouldn’t want to sit in the comfort of their home while products came right to you for just $20 a month. That’s less than a wash, set and blow out every 2 weeks! I saw no harm in my new found love. I started out as one of the many naturals who wanted all natural products. With a subbie box that had different products, I kind of pushed that thought to the side. Then the numbers started to add up, and the products they became so so. I began to feel as if I needed rehab for my product addiction, literally products everywhere. I had to put a stop to it! So this December I treated myself to a kit and a box, just for the fun of it. I was hoping there were going to be some extra dope products and extras, but I mean it was just what I paid for. After, treating myself I called it quits. A new year was approaching and I couldn’t waste anymore money on products that half of the time I wasn’t using anyways. I guess, I can now say I am a product junkie on the road to recovery. Did you stop any of your subscriptions? Do you miss getting products every month?